Jewell W. “Corky” Bottger was born to William H. and Irene Rose (Pullen) Bottger on April 6, 1934 near Wakefield, Nebraska. 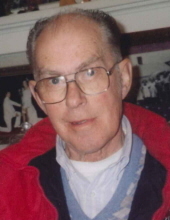 He passed away February 2, 2019 at Tekamah Care and Rehabilitation Center in Tekamah, Nebraska. Corky was raised on a farm and loved to drive the tractor. He had a dog named Rex that would bring the cows home on command. He was very proud of Rex. Corky went to Dixon County Schools, then moved near Martinsberg, Nebraska, where he continued school there. He later attended school in Allen, Nebraska, where he graduated with the class of 1951. Corky and his best friend Emil Schaenrock joined the Navy. Since Corky was only 16 at the time, his dad had to sign for him to get into the military. When he was discharged, he went to Oxford, Nebraska to live with his sister. He managed the grocery store “Lopers” until the Swanson plant closed; many people left town and a manager was no longer needed. A.J. Bruce put an ad in the Omaha World Herald looking for a produce manager. Corky inquired about the job and got it, providing that he shaved his mustache. Corky and Vernita “Dee” Nadine Marble met in the Lopers store. Corky said, “Who is wearing ‘To a Wild Rose’?” It was Dee; she was wearing the same perfume his mother wore. His mother had passed when he was only 14. Corky and Dee wed on January 1, 1956. Corky and Dee moved to Tekamah in April 1957. He worked for Save More Market for 49 years. Growing up, the Bottgers were very strong in the Lutheran religion, always attending church on Sundays and the other functions the church would have. Corky was preceded in death by his parents; daughter, Jill; brother, David Lee; sister, Bonnie; brother-in-law, Vince Schlenker. He is survived by his wife, Dee, daughter, Joni (Bob) Ruetz of Salt Lake City, UT; son, Johnnie (Bridgit) Bottger of Tekamah; brother, Melvin (Saundra) Bottger of Grand Island, NE; 4 grandchildren; 1 great-grandson; and many nieces, nephews and cousins. "Email Address" would like to share the life celebration of Jewell "Corky" Bottger. Click on the "link" to go to share a favorite memory or leave a condolence message for the family.